Yesterday evening, Monday the 16th of November, 26 year old anti-fascist Ivan “Vanya Kostolom” Khutorskoy was shot to death at the entrance to his home at Khabarovsk street in the east side of Moscow; according to some information with two shots to his head. Vanya was a great figure in the Russian anti-fascist movement, and I am sure many people will write down their memories of him in the days, months and years to come. But as of today most of his friends are too angry and too shocked, at the loss of this friend and comrade. completely underground. Thus the concert was openly announced, and you could not be sure who was around. So I was a bit wary of the skinhead crowd, especially this one big guy. But there was no reason to worry, Vanya being there was actually the best guarantee that any trouble would be handled. I do not know where Vanya got his nickname “Kostolom”, “Bonecrusher”. Maybe it was some kind of joke, as it is hard to imagine a more friendly and humorous guy than Vanya. Last time I saw Vanya was at the “No surrender” mixed martial arts tournament, organised on the 10th of October this year in Moscow. 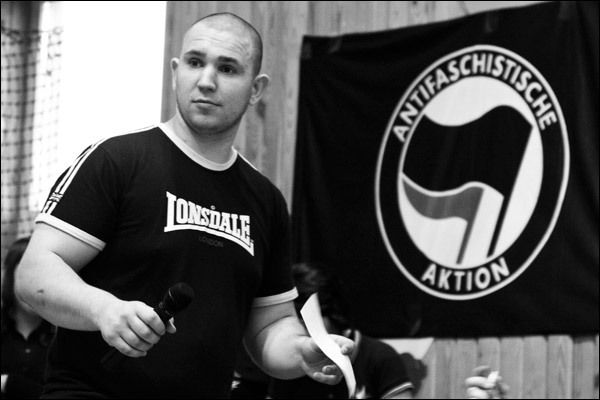 The tournament was organised in memory of another murdered anti-fascist, Fyodor Filatov. Vanya was the referee, as seen in the photo above. Vanya was well-trained in Sambo, a martial arts developed in Soviet Union which is still popular in the region. He he had some success in tournaments and he achieved the degree of Candidate for Master of Sports of Russia. He also competed in arm-wrestling. This was one of the reasons that made him especially feared and hated among Nazis, since they attempt to picture their enemies as weak alcoholics and junkies. Few Nazis could match up to Vanya in a fair fight, this is why they attacked him with razorblades, screwdrivers and knives, and when even that did not work out, with a gun. Before that my last meeting with him was outside the Ska-P concert last May. None of my friends had enough money to pay 30 euros for a concert of Spanish ska-punkers, but we decided to give out free anti-fascist papers outside. After all, on the concert poster the group was in anti-fascist t-shirts – not a big thing in Spain, but something for which a musician may have to pay with his life in Moscow. Thus handing stuff outside was not any worse than leafletting random people at the street. Vanya and a number of other people were asked to cover us. The reaction of semi-yuppie clubbers and punks to our papers was mixed – obviously many were there just to party. Then a phonecall – another group of comrades was in a trouble few kilometers south, followed by a larger mob of Nazis. Our cover had to move to clear things out. I had no plans for a fight that evening, but I had little choice – having distributed anti-fascist papers to hundreds of people, going wandering around afterwards alone could easily end up with 5 inches of steel between my ribs. So I had to stick with the crew. We met with the other mob and regrouped. Vanya warned about not attacking as soon as Nazis were in sight due to the fact that they would figure out that they were outnumbered and just run away and never get caught. But people could not hold themselves back. 100+ meters was way too much distance to close the gap, Nazis ran to alleys and jumped over some fences, no one was caught. I was in bad shape so I could not run as fast as the rest, Vanya simply didn't run because he knew it was pointless. So we were left behind the mob with some girls who avoided being in the frontline, and together we took a look around if any Nazis had hidden in an alley to our side. Later that evening, another regroup – some asses kicked, some more missed opportunities. But it would be pointless to tell all these stories – while I was an unusual guest, for Vanya beating up Nazis was as routine as waking up in the morning. To tell one of these stories would be to tell nothing, as there are hundreds of them. Vanya was a common face in the punk scene since the beginning of the century. Anti-antifa websites have large galleries of him, the oldest photos with a mohawk hairstyle. He was not in the first Moscow Antifa generation which got together around spring of 2002, but when he joined up in 2003-2004 he stayed for good. Sometimes, after such tragedies, there is a kind of sad body-snatching match going on where everyone wants to claim a dead hero – that was the case for example with Stanislav Markelov, who, while still alive was a prankster who told to anarchists that he was a social-democrat, and to trotskists and stalinists that he was an anarchist, just to frustrate everyone. With Vanya, any such post-mortem claims would be a misrepresentation any way you look at it, as every clique and crew in the scene considered him one of their own, and he was respected and loved by absolutely everyone. Vanya considered himself a RASH skinhead, which did not hold back the apolitical and patriotic Moscow Trojan Skinheads from considering him as one of them. Anarchists of course considered Vanya one of the anarchists, and it is true that Vanya had an anti-authoritarian and social position and was always ready to provide security for anarchists events. But he did not live for activism – he lived for the streets and for punk rock. He was as sharp as a razorblade, and he finished his juridical studies at the Russian State Social University with a “red diploma”, that is a diploma “with excellence” given to students in the region of the former Soviet Union who have almost exclusively the best possible grades. As there are few people with juridical studies in the scene, I had some hopes that Vanya would join the ranks of the activist lawyers when he would retire from street fighting one day – even before he was murdered, Stas Markelov was overhelmed with legal cases from our movement and had trouble in dealing with them alone. Vanya and Stas knew each other well, and Vanya also provided security to some press-conferences held by Stas. Most recently Vanya worked as a lawyer in “Deti ulitsy”-center (“Children of the street”), which works with street children and other children with difficulties. Of course people now ask why he went to his flat that evening, although his address was posted all around in the Nazi websites. Vanya often stayed in other places. Maybe he had some important business with his family, maybe he just spit in the face of death, having survived so many attempts on is life. Vanya was jumped the first time in 2005 and his head was cut with a razorblade. This incident was recorded with a CCTV camera and used in a TV documentary of NTV channel, which is available online here. Next time, in the autumn of the same year, they attempted kill him – his neck was punctured 6 times with a sharpened screwdriver, which is a popular weapon among Russian Nazis as it punctures deeper than a knife. Any of these strikes could have been lethal, but miraculously none of them hit arteries and he survived. This incident was also recorded to a CCTV camera, but cops had little interest in investigatingand they didn't even check the recording! It took more than half a year for Vanya to fully recover from this attack. In January of this year, Vanya was stabbed in his stomach during a street fight, this wound was almost lethal as well but he survived. And now, when everything else failed, Nazis decided to use guns – they finally succeeded. Vanya's father died a few years ago, he is by his mother and his sister. Donations to support friends and family with funeral costs are welcome, you may use Yandex-money account 41001411894609, or in case you do not know what that is, you may donate through ABC-Moscow: http://www.avtonom.org/donate. But in this case write to ABC-Moscow about your plans (abc-msk AT riseup DOT net, and also indicate in transfer that it is “for Kostolom friends and family”. gathering peacefully and had not intentions to demonstrate at the spot. police tried to grab people but everyone was succesfully dearrested. picked as a target due to its links to neonazis. My condolences, that sounds like a bitter loss to have to swallow. I'm sorry that this is buried under the Greek rebellion stuff but people are still reading about it. A Hero if there ever was one.